Well, so far, so good! Today was B's First Holy Communion, so we went to church. 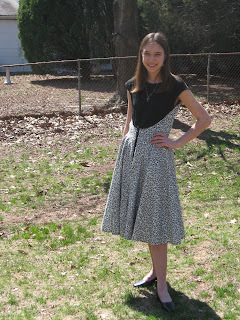 I wore my retro wrap dress which I made from a Butterick pattern. It claims to be 1952 fashion, but I am a bit skeptical that it can be pinned to one exact year. I also made a good deal of progress on the prom dress. I have a bit of lining to attach and the hook and eye to sew. Then I'll be done! We also have a new washing machine. In other words, it's been an all-around good day.